Martial Arts Federation has expanded to forty nations ever since its establishment and is continuing the founder’s spirit of Love God, Love all People and Love your Country. Martials Arts Federation for World Peace (Martial Arts Federation in short) hosted the Martial Arts Festival in Commemoration of the Third Universal Seonghwa Memorial of Sun Myung Moon, the True Parents of Heaven, Earth and Humankind at the gymnasium in Cheongshim International Youth Centeron 7.12 by the heavenly calendar (Aug25), 10.30 a.m. 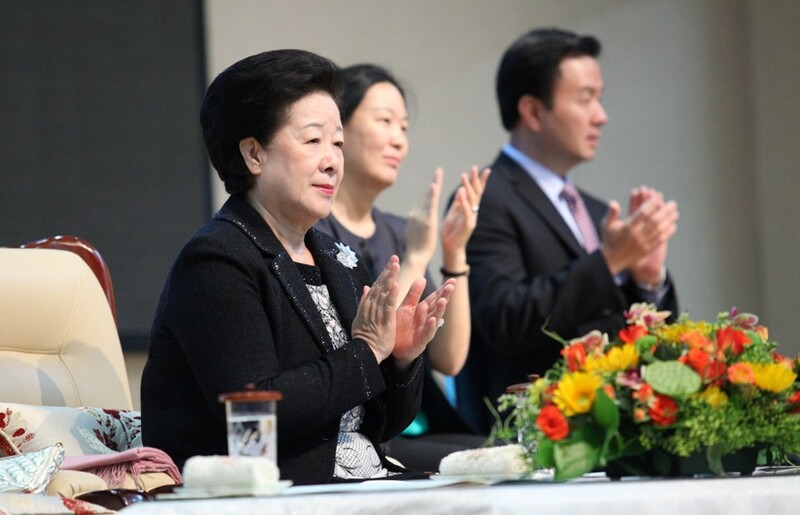 True Mother honored the event on this day by observing in person the martial demonstrations of our blessed families’ second- and third- generation martial artists and their congratulatory performances and by encouraging their work. She was welcomed with ardent cheers and applause as she made her entrance. 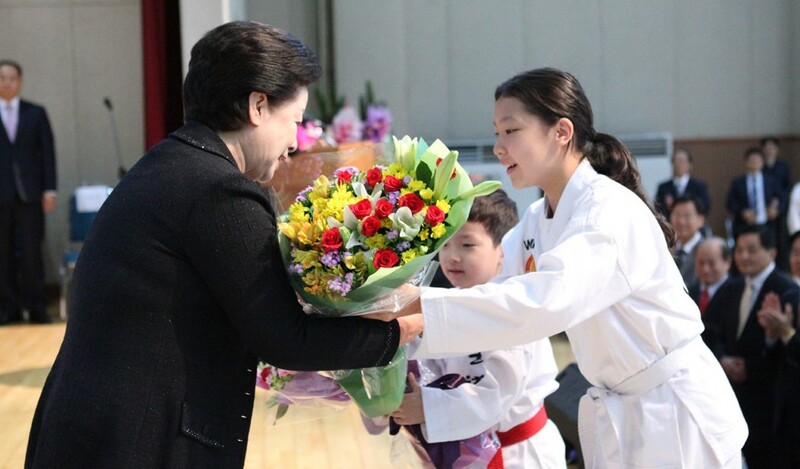 After receiving a ceremonial bow from everyone, she received a bouquet of flowers from a representative second-generation martial artist. From a seat prepared for her on stage, she watched the martial arts demonstrations of the second part of the event. Around 700 people including the Women Federation for World Peace (WFWP) Chairwoman Moon Yeon-ah, the Family Federation for World Peace and Unification (FFWPU) International Vice-President Park In-sup, heads of providential organizations, key leaders, eighty or so martial artists, the first class of the Global Top Gun Workshop, Universal Peace Academy cadets and members participated in this festival, a time of resolve and determination to inherit True Parents’ teachings and honor True Father’s great life and spirit. Today’s event was emceed by Martial Arts Federation President Moon Pyeong-rae. 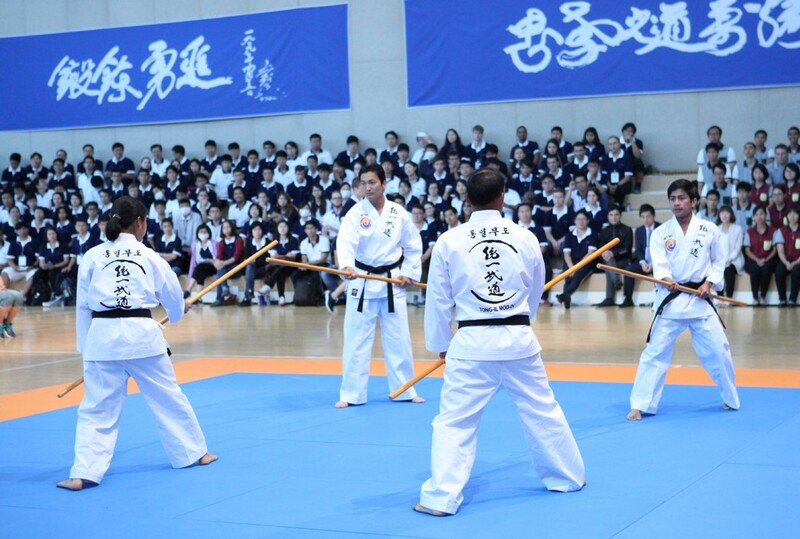 The event was divided in two parts: the memorial ceremony and demonstration of martial arts. The ceremony went in the following order: the opening remark, ceremonial bowing, the Cheon Il Guk Anthem, a report prayer by Cheongpyeong Heaven and Earth Training Center Lee Gi-seong, floral tribute and silent tribute, opening message by Martial Arts Federation Chairman Moon Kwon-jin (Read by Martial Arts Federation Vice-President Seok Il-jing) and words of encouragement by FFWPU-Korea President RyuKyeong-seuk (read by FFWPU-Korea Vice-President Lee Hyeon-yeong). Martial arts demonstrations, which were held in True Mother’s presence, began after the first part ended. First of all, teams of second-generation and third-generation members re-created a story. Next, the True Love Peace School team gave a demonstration centered on district pastor Hwang In-chun. Thirdly, four cadets from the Universal Peace Academy demonstrated discipline and courage through their performance of martial arts using sticks. Following it, the Japanese Cheon-Bu-Eun-Go team presented a special performance based on Moon Hyo-jin’s song, “Be Successful” to express their firm loyalty and filial piety for True Parents. Fifth, the Seonjeong–Seonhwa Brothers International Team presented a performance. One particular plot centered on Shin-chulnim conveyed the firm determination of blessed children that they will pierce through the darkness and move on to become True Parents’ hope. Finally, martial art demonstrators of the Martial Arts Federation presented the essence of TongilMoodo based on Divine Principle contents including the four-position foundation and the give and receive action, by forming harmony between soft circular movements and strong strait-line movements. All participants then stood up and sang together “Saranghe Tangshin-eul” with a heart of respect and gratitude toward True Parents. Following the song, Universal Peace Academy Principal led everyone with three cheers of uog mansei. The entire event came to an end after taking a commemorative photo. Kim Yeong-gi, member of North Gyeonggi Guri Church and guest at the event, gave the following reflection on the event: “It is the 23rd anniversary of the 30,000-couple Blessing and our last son performed as part of the True Love Peace School team. I am truly grateful and it is an honor that we could show True Parents our hearts of loyalty and filial piety through this meaningful Martial Arts Festival.